This simple edifice consists of a rectangle of alternating light and dark bands of brick with inside it a glass block cylinder housing two rotary pumps. The cylinder has a pyramid-shaped roof which can be removed to change the pumps. Two tapering steel beams projecting through one of the side walls announce the presence of a travelling crane, there to raise the pumps should they need maintenance. 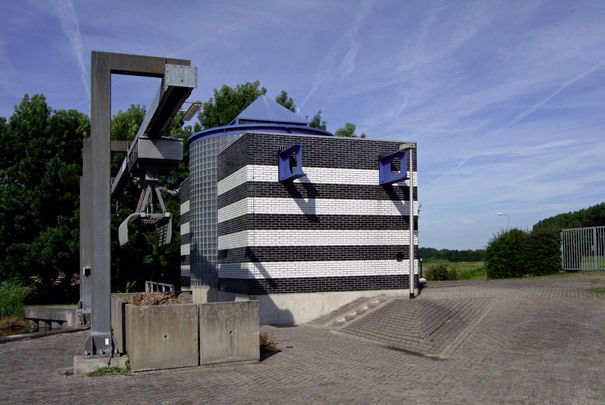 Small aluminium rotary pumps by the same architect can be found here and there in the surounding polder landscape.